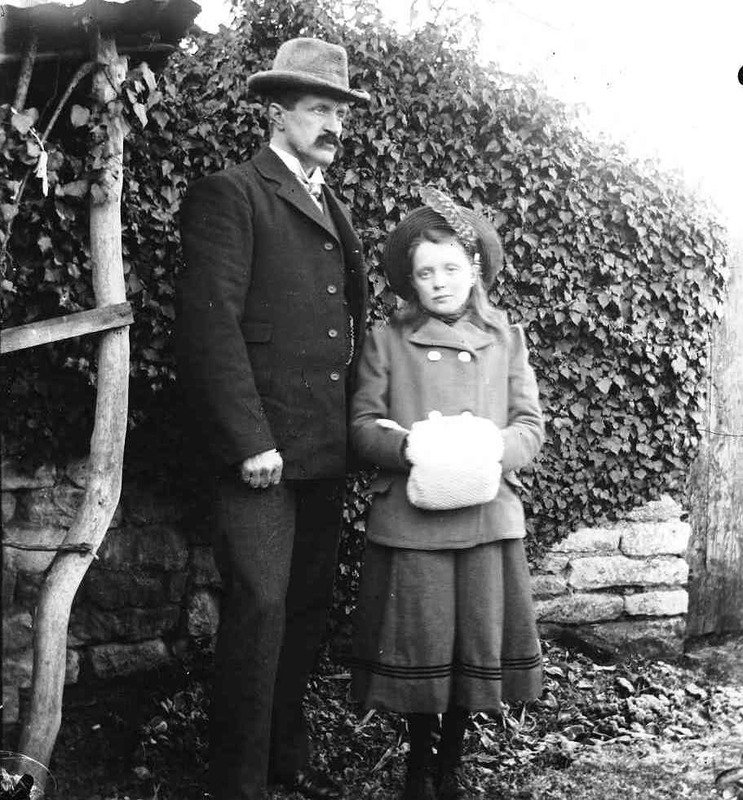 Dorothy Taylor with her father Jesse. Alice Mary Dorothy Taylor was born in Bedminster, Bristol, in October 1889, the daughter of Jesse and Alice Taylor. Alice was from the Stanley family in Ebrington, living with her grandparents in Bristol at the time that she met watchmaker Jesse Taylor. They married in 1888 and Dorothy was their only child. The family moved to Chipping Campden in the early 1890s and Jesse set up shop in the High Street as a watchmaker and repairer. He soon became interested in photography and by 1897 was advertising himself as a commercial photographer. From then until his death in 1938 he took thousands of glass plate photographs – on commission or converted to postcards to be sold in his shop. Dorothy Taylor featured in a number of her father’s photographs, not only recording her childhood, but also providing added life to scenes of the High Street. In 1910 Dorothy married William Greening, a Birmingham man, and it is possible that their families were friends. They lived in Campden with her parents and an uncle from Bristol, Tom Taylor, who had joined his brother to help in the business. By the 1911 census William also had become a photographer’s assistant and Dorothy was a piano teacher, following her mother’s profession. …Greening was a very shabby looking, tall man who was I think Taylor’s assistant. Mrs. G herself was ever smiling with bright red apple cheeks and she would pound the Town Hall piano for hours on end to accompany the dances at the village ‘Hops’ held in the Town Hall at least once a week. In the late 1920s my sister Angela and I used regularly to attend these dances with a group including Philip Chandler, Christopher Whitfield and his aunt Dorothy Chatwin, the Slattery girls, the Ayling girls, Jeanne Heaton, sometime William and Tom Odling from Paxford, Bill Adam, Gordon Bolitho, etc. Incredibly we wore dinner jackets with the girls in smartish frocks and we formed a tight-knit group dancing only with each other. Nonetheless we were greeted with smiles and perhaps amused tolerance by the Ellises, Bennetts, Howells, Keytes and other local Campdonians as we mingled on the dance floor. It sounds now like an appalling example of class snobbery but at the time it was regarded as the norm. The odd thing was that had I or one of the other males in our group approached one of the ‘village’ girls and asked for a dance the whole balancing act would have collapsed and the atmosphere would have turned very sour. Dorothy also ran a library in the photography shop and one local child’s memory is of being scared of Mr Greening who was tall and gaunt with staring eyes behind his glasses, on going in to borrow a book. When ill health forced Jesse Taylor’s retirement in the 1930s William Greening took over the photography business. He continued to take photographs throughout the 1940s, still using the plate camera. Local memories refer to William’s nickname ‘Split match and cut candle’, having gained a reputation for meanness, and this may be reflected in his reluctance to buy a modern camera. Finally, failing eyesight forced him to stop taking photos, but they continued to sell the postcards from the shop and Dorothy maintained her teaching, until they retired in 1957 to the Almshouses. Dorothy died seven years later on 13 May 1967, aged 78 and just 9 months after her husband’s death.